Rabbits have very sensitive digestive tracts. Your pet rabbit may become constipated if her digestive system is thrown out of balance. Constipation in rabbits can be due to stress, illness, intestinal blockage or dental problems. However, pet rabbits can often become constipated when fed an improper diet. To prevent this potentially serious health problem, it’s important to understand your pet rabbit’s dietary needs, and the role the right balanced diet plays in keeping her healthy. Rabbits are creatures of habit when it comes to mealtimes, so try to feed her at the same time each day. Your rabbit will need plenty of fiber in her diet to keep her digestive tract moving freely. Feed her plenty of grass hay, such as timothy hay. Avoid alfalfa hay, which is too high in protein and calcium, and will be too rich for your bunny. Provide her with pellets designed specifically for rabbits, but limit the amount of pellets to make sure she doesn’t overeat. The right balance of vegetables is also a very important part of your pet rabbit’s diet. When considering which vegetables to feed your bunny, think salad. Salad is as good for your rabbit as it is for you, but you should only introduce the vegetables one at a time and watch your bunny for any signs of soft stool or diarrhea. Rotate the selection of greens for her to try, so she can vary her chewing pattern. This will keep her teeth and mouth healthy. Some leafy greens like parsley, mustard greens and spinach should be limited to just two or three meals a week, as they are high in oxalic acid, an alkaloid which can help boost the immune system, but could also result in toxicity if fed in large amounts. Your bunny will also love fresh herbs, such as basil. How Much of the Good Stuff? A good rule of thumb is to feed her 1 cup of salad vegetables for every 4 pounds of body weight per day. A rotation of leafy greens such as parsley, spinach, kale or basil should make up about 75 percent of the fresh portion of your rabbit's diet. Non leafy vegetables such as carrots, broccoli stems, celery or cabbage should make up approximately 15 percent of the fresh portion of your bunny's diet. While rabbits do love carrots, they are high in sugar, and should be given only as a special treat. The leafy carrot tops are a better and healthier choice for your bunny. The same goes for fruits such as apples, which should comprise no more than 10 percent of her diet. Rabbits love sweets, and will binge on the sugary treats instead of eating the healthier greens. Avoid giving your rabbit any kind of legumes such as beans and peas, as these can cause gastrointestinal problems. Feed vegetables such as broccoli and cauliflower sparingly, since they are higher in starch than other vegetables. Avoid vegetables in the onion family, such as leeks, chives and green onions. 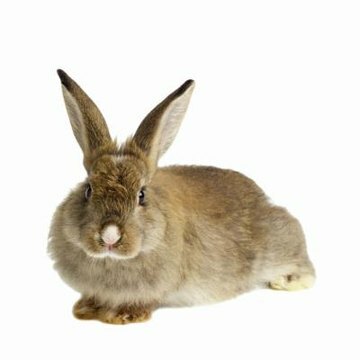 If your rabbit is hunched over in pain, has stopped eating, and has passed small, hard stool or not passed any stool at all in 12 or more hours, she may be constipated. Constipation in a rabbit, also known as gastrointestinal stasis, is very serious, and you should take her to the vet immediately. The best way to avoid this often deadly condition is to ensure your bunny has a diet rich in fiber, access to plenty of clean, fresh water and a varied assortment of vegetables. Avoid starchy foods like bread, pastries and cereal, and avoid chocolate at all costs. A healthy diet of hay, pellets and an adequate assortment of rabbit-safe vegetables should keep your rabbit’s digestive tract functioning nicely. Why Do Rabbits Need Protein in Their Diet? What Fruits Do Dwarf Hamsters Eat? What Causes a Mother Rabbit Not to Have Milk?